Home » Blog » Here’s to a Happy New You! Here’s to a Happy New You! THE BEGINNING of a new year usually means it’s time to reflect on what you’ve accomplished during the last 365 days and decide what you hope to achieve in the next 365 days! Eagle Landing is not immune to this microscopic fitness review. We are pleased to announce the following enhancements to its Athletic Center, Golf Club and The Landing Bar & Grill! THE LAST THREE MONTHS of 2017 brought a flurry of activity to the gymnasium. Lines were repainted and pickleball court lines added. Touted as the ‘fastest growing new sport in the USA‘, pickleball is a combination of tennis, badminton and table tennis and enjoyed by all age groups. A PICKLEBALL AMBASSADOR is meeting with Eagle Landing residents during the coming weeks for a more formal introduction to the sport. 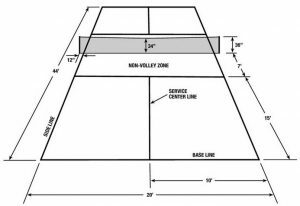 The first “Open House” for potential pickleball players (say that fast 3 times…) is scheduled for Saturday, December 23rd from Noon – 2pm. Additional 2018 dates to be determined. CONSTRUCTION HAS STARTED outside as additional tennis courts are added to the existing 8 lighted, Har-Tru® courts. Two additional clay courts and 2 hard courts will be ready this spring. 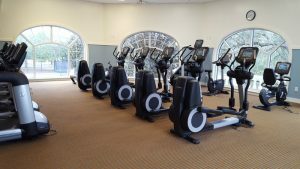 The Fitness Center received new equipment in early December – including a rowing machine, Stairmaster® and additional free weights. Staff repainted the entire fitness area and cleaned the carpets giving the fitness area a much needed facelift. The Athletic Center is the hub for tennis, basketball, volleyball and now, pickleball. In January, Eagle Landing features their “Biggest Loser” competition. Weigh-ins are scheduled for January 6 & 7. Encouraging all participants is Precision Fitness Imaging They are offering 3D total body scans. First image is free with additional scans offered at $25 per. The scan takes all common circumference measurements and provides other useful data – all under a minute and in total privacy. Spots are limited and filling up fast. Register here. NEW LOOK for the Golf Clubhouse & Pro Shop: The pro shop is redesigned offering easier access for all golfers including an enhanced display area for the latest golf equipment and apparel. THE LANDING BAR & GRILL is undergoing a renovation with estimated completion date this spring. The outdoor veranda overlooking the driving range and 9th fairway is ready for lunch or dinner. Enjoy all the new furniture including a comfortable seating pod with fire pit. EAGLE LANDING, located in northern Clay County, includes an 18-hole championship Clyde Johnston-designed golf course, a golf clubhouse and its Athletic Center and Tennis Club. The Residents Club includes a Village Store, Café and the Lake House. The community also offers a swim park with four pools, a kids club, miniature golf, an outdoor amphitheater with movie screen, numerous neighborhood parks and playgrounds, and scenic hiking/biking trails that stretch along untouched conservation areas. A full-time recreation staff plans year-round programs, clinics, camps and social activities for kids, teens, seniors and families. VISIT EAGLE LANDING and see for yourself everything we have to offer our residents. Directions are below. Please make our Welcome Center your first stop for an overview of the entire community and the exciting things happening in and around Eagle Landing. Check out our resident events schedule, the fantastic amenities available, our exceptional golf course, restaurant and we provide information about all our builders – all in one place! DIRECTIONS: From Blanding Blvd., take Argyle Forest Blvd (Oakleaf Plantation Parkway) 8.9 miles to the Eagle Landing entrance on the right. The community’s Welcome Center is on the left. From I-10, take Chaffee Road to Oakleaf Plantation Parkway. Take a right onto the parkway and drive 2.6 miles to the Eagle Landing entrance. The Welcome Center, located at 3973 Eagle Landing Parkway, is open Monday through Saturday from 10 a.m. to 5:30 p.m. and from noon -5:30 p.m. on Sunday. 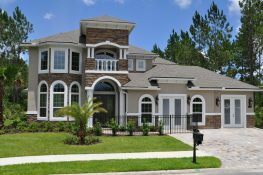 For more information on Eagle Landing, call (904) 291-7200.